LLR23100 : Lorell Lorell Breathable Mesh Guest Chair - Fabric Black Seat - Steel Black Frame - Black - 23" Width X 9"
Lorell Breathable Mesh Guest Chair - Fabric Black Seat - Steel Black Frame - Black - 23" Width X 9"
Inviting Guest Chair Features A Breathable Mesh Back And A Cushioned Seat Upholstered In Black Fabric For Comfortable Seating In Your Waiting Room Or Office. Chair Is Stackable Up To Four High For Convenient, Short-Term Or Long-Term Storage. Black Steel Frame Is Powder-Coated For Durability. Weight Capacity Is 250 Lb. Back Measures 18-1/2" Wide X 2" Thick X 13-1/2" High. 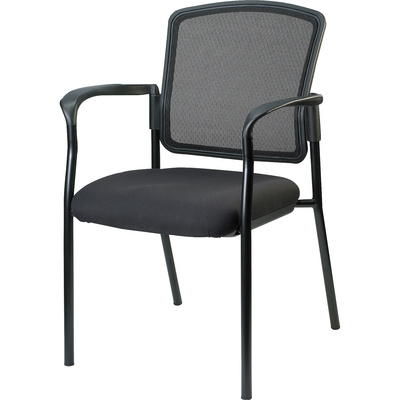 Chair Is Greenguard Complaint..
Inviting Guest Chair Features A Breathable Mesh Back And A Cushioned Seat Upholstered In Black Fabric For Comfortable Seating In Your Waiting Room Or Office. Chair Is Stackable Up To Four High For Convenient, Short-Term Or Long-Term Storage. Black Steel Frame Is Powder-Coated For Durability. Weight Capacity Is 250 Lb. Back Measures 18-1/2" Wide X 2" Thick X 13-1/2" High. Chair Is Greenguard Complaint.